“They are all about the same” – my Mom. 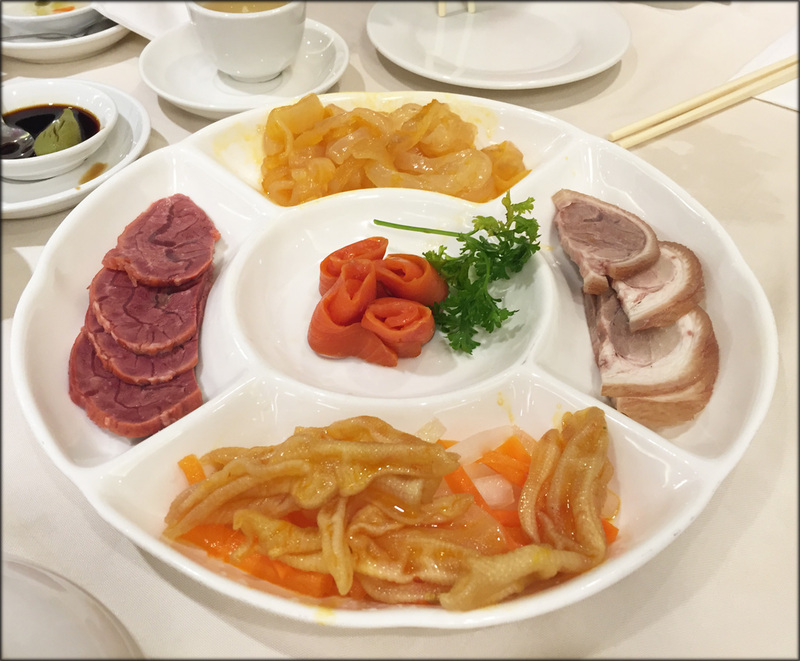 When it comes to dining out for an everyday Cantonese meal, my family doesn’t bother checking reviews when trying out a new Cantonese restaurant. To some extent I agree with my mom. 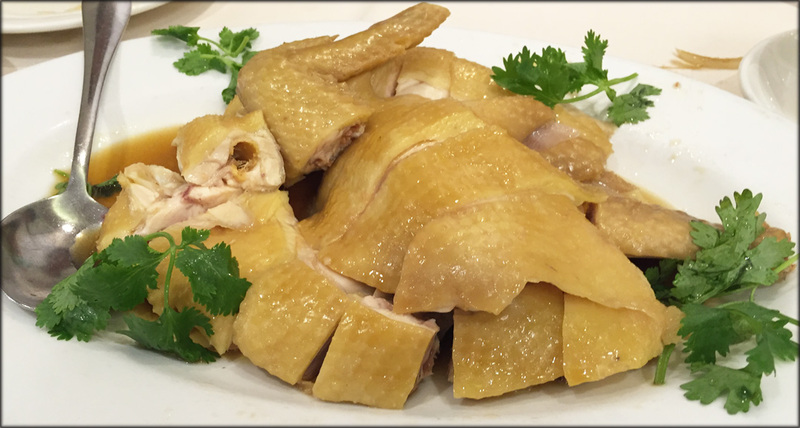 Within the same price range, it really is hard to differentiate one Cantonese restaurant from another, other than a special dish the eatery may serve. How you do really quantify Wok Hei? To be honest, in my recent memory I don’t think we have had a truly bad meal out. 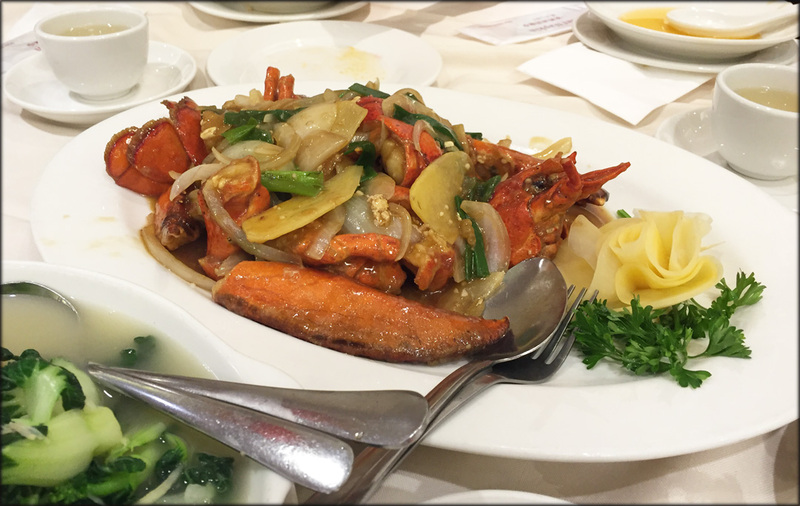 It speaks to the depth and strength of Cantonese cuisine in Vancouver. Don’t get me wrong, there have been some meh meals but nothing down right awful until now. Our family ordered the set meal for four priced at $148. We usually opt for set meals as it eliminates the hassle of leafing through the massive menu and then having to come to a consensus on dishes. Unfortunately the restaurant ran out of the first dish, the squab. The staff was also devoid of customer service. Our family was only given one option as a replacement, a cold appetizer platter. We asked if we could substitute something else and the answer was no, like it was our family’s fault for their squab shortage. Even an offer of paying extra for a dish we actually wanted, which at most places opens up the entire menu for us to select from, was rudely turned down by the manager. This was a bad start for the dinner. The cold platter was simply 4 slices of chilled meats like beef, pork hock and smoked salmon. The jellyfish and goose feet were overly salty and had a faint fermented tofu flavour, which was very peculiar for these two items. This was not a great substitute for squab. The next dish was the soup but instead of arriving in a small tureen, 4 shallow bowls arrived. I think this was meant to make the dish more luxurious looking but it was a fail. For me it come off as chintzy, since the customers doesn’t get to see how much soup was actually served. Also the bowls were a poor match for the clunky and thick traditional Chinese ceramic spoons. It was very hard to scoop the soup out of the bowl. 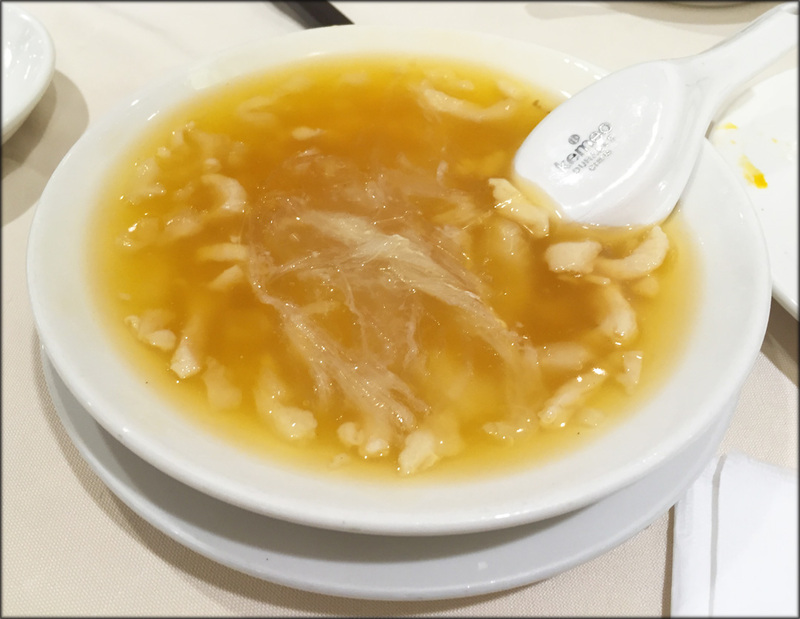 In the end this may have been a blessing in disguise as the chicken, fish maw, and maybe shark fin soup had an off plastic taste which was the strongest flavour component. The broth had a very weak seafood umami taste. We left this item mostly uneaten. 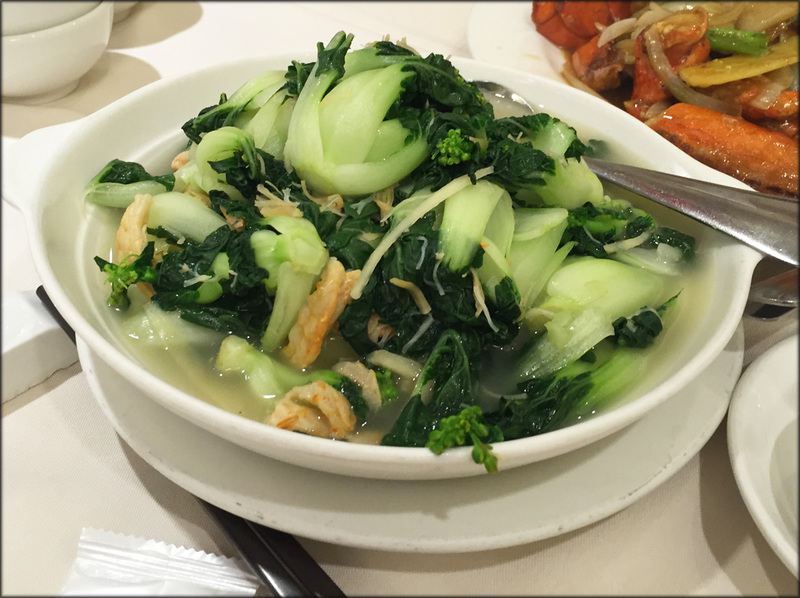 Continuing the descent into cheapness, the dried scallop and shrimp baby bok choi dish was a heaped mess on a plate. The dish was so poorly presented. The stems of the vegetables were not trimmed properly. There was more of the cheaper dried shrimps used and barely any dried scallop shreds. Once again this dish lack any flavour. The lobster arrived and it was another bland fest. What was worst was there was utterly no wok hei. The dish tasted like it was prepared on the gas stove I have at home and not the super powered blast furnaces that good Chinese restaurants have in their kitchens. The seasoned poached chicken was flabby and mushy but it at least it tasted all right. Unfortunately the important ginger scallion dip had an off smell and taste. The most offensive dish arrived last. The most awful fried rice was plunked onto our table. The rice was mushy and wet. This definitely demonstrated that person in the kitchen had no clue what they were doing. 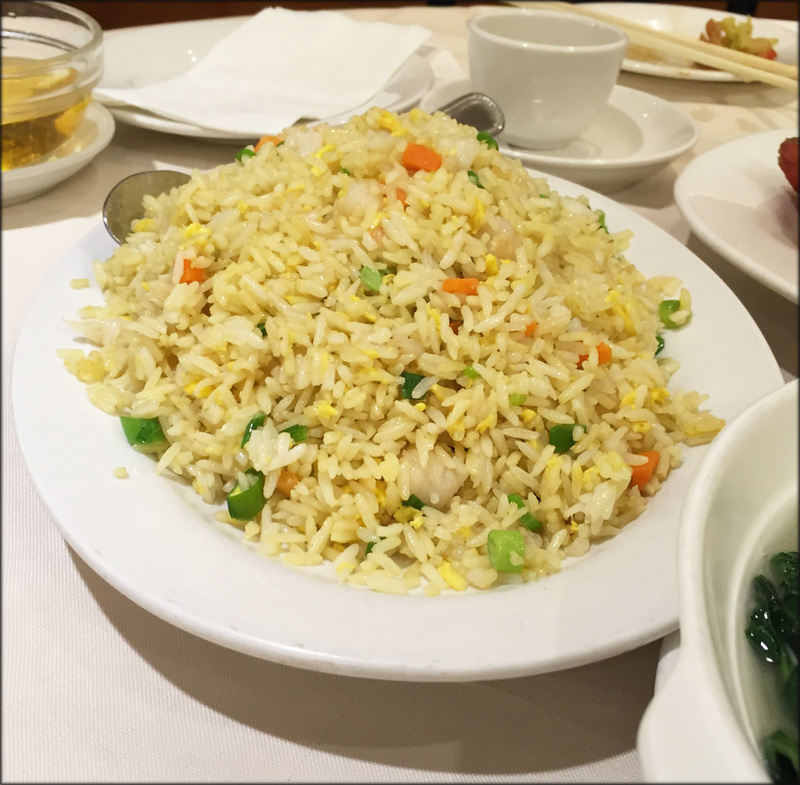 A zero wok hei and squishy fried rice is a sin against Cantonese food. I’m not even going to get into why there were frozen western veggies like beans and carrots in the rice. This was the worst Cantonese meal I have had in a very long time. Since it was Monday maybe we got the back-up cook or something because there’s no way this place has stayed opened for as long as it has based on this level of cooking. To add insult to injury this meal cost $148 plus tax. We easily could have eaten better-prepared food for a third less. The clueless staff was actually pissed off when my sister tipped only 10%. I thought my sister was being too generous. You know it’s bad when my thrifty mom did not want any of the leftovers to be packed up and taken home. Thanks for the warning! I was eyeing Top Cantonese on Saturday driving home from our stellar meal at Yummy Mammy, for which we paid $35 each, including tax and generous tip.